William Morrow Cookbooks, 9780062248701, 336pp. From the author of the popular French Kids Eat Everything, a simple, easy and surprisingly fun way to change dinnertime reactions from YUCK to YUM. Are mealtimes with your kids a source of frustration? Ever wonder how on earth to get them to eat the recommended 5 servings of fruits and veggies per day (or even per week)? 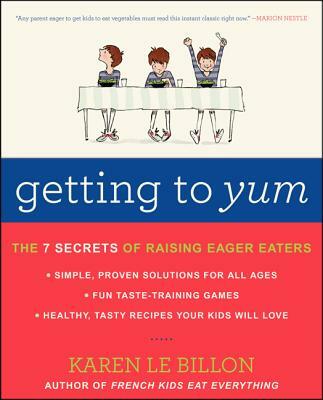 Karen Le Billon, author of French Kids Eat Everything, coaches readers through the process of taste training, including strategies, games and experiments that will encourage even reluctant eaters to branch out. Over 100 delicious, kid-tested, age-appropriate recipes lead families step-by-step through the process of "learning to love new foods," enabling kids to really enjoy the foods we know they should be eating. Wise and compelling, Getting to YUM is grounded in revolutionary new research on the science of taste. Packed full of observations from real-life families, it provides everything parents need to transform their children—from babies to toddlers to teens—into good eaters for life. Karen Bakker Le Billon is a professor at the University of British Columbia, and was named one of Canada’s Top 40 Under 40 in 2011. A Rhodes Scholar with a Ph.D. from Oxford, she has published five academic books and Getting To Yum, a guide and cookbook on taste training for kids. She and her family divide their time between Canada and France. Her website was named a Jamie Oliver’s Food Revolution Blog of the Month. Any parent eager to get kids to eat vegetables must read this instant classic right now. Getting to YUM makes it a pleasure to teach kids about delicious food, encourage healthier eating habits, and counter the relentless marketing of junk food, without ever turning the dinner table into a battlefield. Want your kids to be food lovers? Karen takes away the pressure, stress, and frustration of mealtime with interactive food games and simple recipes that make eating a joy for the whole family!